Detachable Pack, Type C. Stores reference 27C/1920. 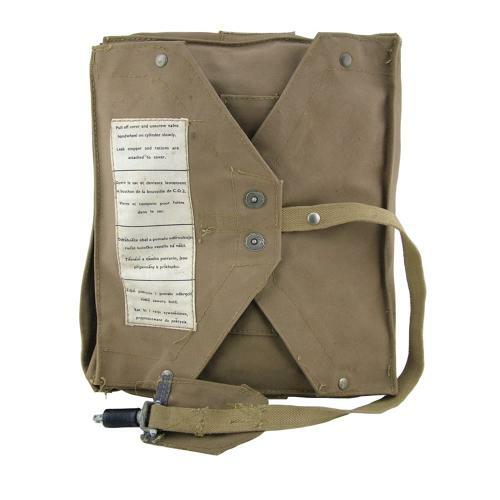 The single-man Type K dinghy was carried folded and compressed within a variety of different packs and used in conjunction with the airman's parachute equipment. The Type C pack is manufactured in heavy cotton canvas and consists of a rectangular box-shaped envelope with three hinged flaps. The fourth flap forms a detachable flap to which a webbing lanyard is attached complete with quick release unit. A false base is attached to the detachable flap and has various pockets for stowage of dinghy sailing equipment and accessories. Large snap hooks are positioned on either side of the pack and used to attach it to the anchorage 'rings' of an Observer parachute harness. A multi-lingual label is stitched to the cover. See Luftwaffe Vs RAF, Flying Equipment of of the Air War, 1939-45 by M Prodger, p.62/3. The pack is really quite clean and in very good condition bar minor verdigris on the the lift-the-dot fasteners and clips. Another from our own collection. Stock code NIVD-pack.